It's the time of year again. Time to search for the perfect unique and original gifts for those dearest to us. To help, we've compiled a Christmas gift guide with products made by CarveOn and other Irish Craft-Makers. So this Christmas why not give wonderful gifts while helping local businesses. One of our best selling products and crafted from premium Italian leather our notebooks blend style with functional design. A great gift for the student, professional or aspiring author, the notebook can be customized with initials, name or custom artwork / branding and comes with a refillable A5 notebook. This large leather tote bag is perfect for everyday use. Crafted from thick, high quality, leather it comes in a range of stunning colours. Roomy enough to hold both a laptop and your daily essentials, it's a great gift for someone who has a lot to carry. For the golf enthusiast in your life, a custom leather scorecard holder is going to make their Christmas. Designed for professional and amateur golfers, it holds a standard 14cm x 20cm golf scorecard and pencil, and fits in your back pocket. For the little ones who love spending time outside in the Irish winter, these coats will keep them warm and toasty. Made of pure Irish wool, the Grey Wool Coat has a detachable hood and a horse pattern lining. The Tweed Coat is called "Spotted Rock" because it's handwoven Irish tweed reflects the landscape. With a detachable hood, wooden buttons and a quilted padded lining, it's a beautiful coat, fit for an adult, made for a toddler. Available in a variety of colors, and prepackaged in a stamped gift box, this handmade recycled guitar string bracelet is the perfect stocking stuffer for anyone who loves music. Another nice stocking stuffer, the keyring is handmade from a soft leather and finished with a solid trigger hook. Like all of our products, personalization is free and so is shipping in Ireland and the UK. 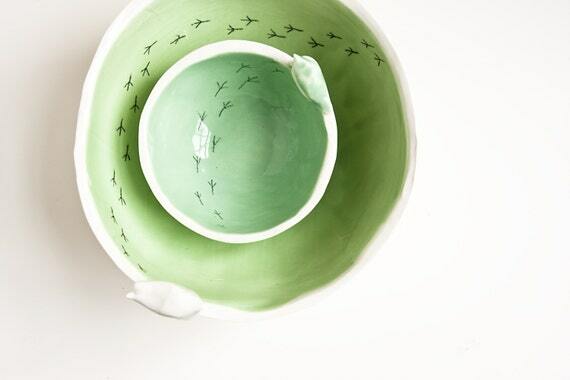 These absolutely adorable ceramic dishes come with a little white bird (or two) perched on the edge and black footprints marking the inside of the dish. Made of white porcelain clay decorated in a variety of colors, they perfectly stack together and make a bright addition to any kitchen. Each gift wrapped bowl comes with a tag that tells really cute story.